[Jesus said,] "And if you do good only to those who do good to you, why should you get credit? Even sinners do that much! And if you lend money only to those who can repay you, why should you get credit? Even sinners will lend to other sinners for a full return." So often we have a circle of "nice folks" or "familiar folks" with whom we associate and for whom we extend a special grace. Jesus reminds us that even sinners have that kind of circle and are nice to people who fit in their special circle of friendships. 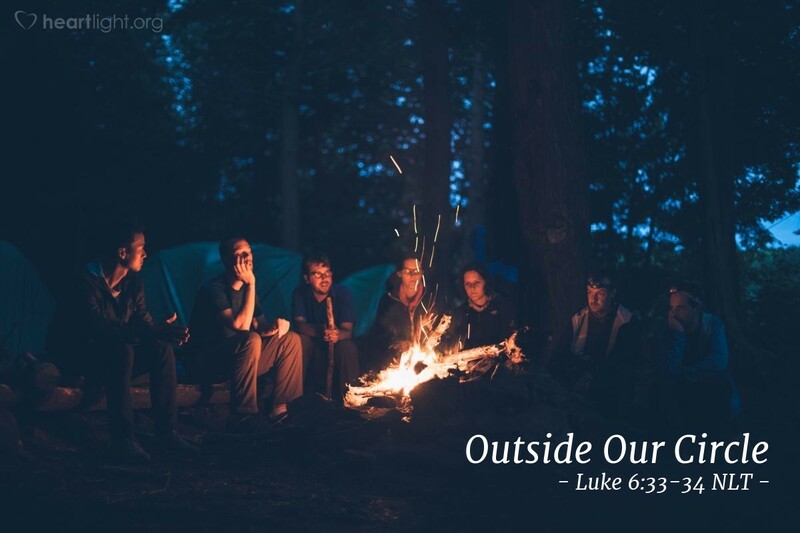 However, Jesus' disciples, those who are true children of God, open their circles to folks other than their close friends. Why? Because we are called to be redemptive, to make an eternal difference in the lives of others. So our goal is not to get what we think we deserve out of social relationships, but it is to help others get to God's grace. That principle, that kind of heart, changes everything. Loving Father, give me the courage to extend my kindness outside the limits of my comfort zone so that others can revel in your grace. In Jesus' name, I pray. Amen.